A registered nurse in Saskatchewan, Canada, posted a comment on social media regarding the care of her grandfather who had recently passed away at a long-term care facility. The comment suggested the staff suffered from a lack of compassion and education. To this nurse’s surprise, charges were filed against her license for harming the standing of the profession of nursing under Canada’s “Registered Nurses Act.” She was found guilty and ordered to pay a $5,000 fine as well as an additional $25,000 for the costs of the investigation and hearing. I take issue with this decision. Why? Because she was acting as a daughter in speaking her mind regarding her grandfather’s long term care experience. However, nurses are considered to be professionals 24 hours a day. 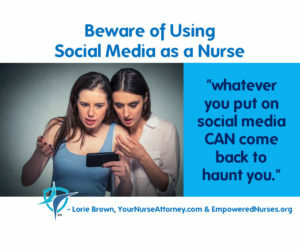 For this particular nurse’s story, we can take away that whatever you put on social media can come back to haunt you. Nurses should talk only about themselves, the nursing profession, their family, hobbies, and interests. Never talk about patients or identifiable coworkers. Avoid identifying your employer on your social media profile or in your postings. Become keenly aware of your employer’s social media policies. Don’t post online that you are at work as this could put you and your home at risk. Don’t use the employer’s internet to post and don’t post to social media site while at work. Don’t post anything online which you would not say in front of your boss or human resource director. Don’t do anything that you would be embarrassed to say to your own mother, your clergy, your boss or potential employer. Realize that nothing on line is ever really anonymous. Don’t do anything that could degrade or embarrass the nursing profession. Furthermore, NEVER talk about patients on social media! In one situation, several nurses at a children’s hospital posted funeral arrangements for a long-time patient. This could have and may have indirectly identified the deceased child to anyone who then would read arrangements for the child. All the nurses were disciplined by the Board of Nursing. Remember, you are a professional and want to represent your profession in a positive light. What are your thoughts on social media and nursing? Do you utilize it? If so, what suggestions might you have to keep your license safe? Please leave your comments below.